I've come to a place in my reading career, as many readers do, where I absolutely should not borrow any more books from the library. I have two piles of books at home that need to be read, and I just figured out how to get some free books for my Kindle. If you like to read e-books, I highly recommend checking out Book Bub. Seeing the books stacked up on my dresser waiting to be read makes me want to read them even faster. It's becoming almost a game. How much can I read in a month? How fast can I finish a book? I'm a sick, sick person. I know. 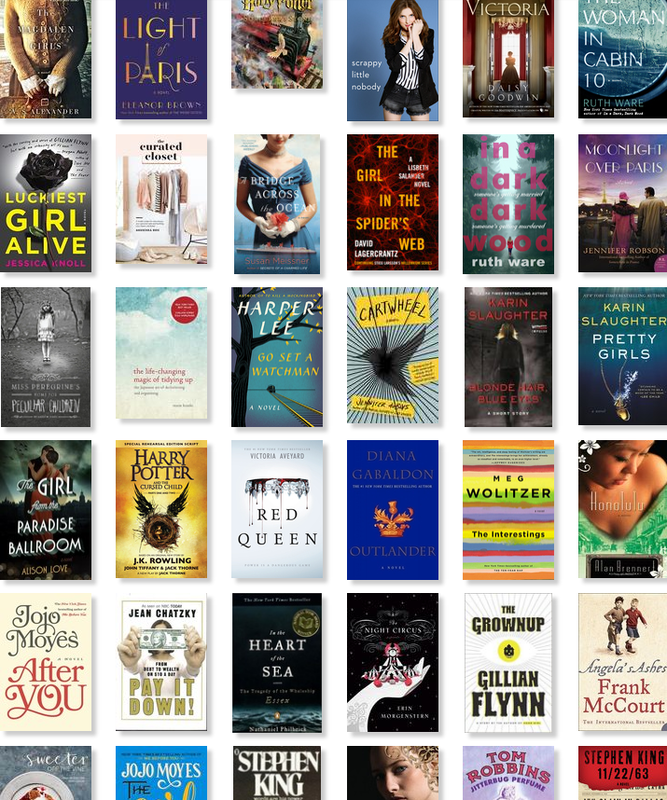 But thankfully reading more means that I have actually read some pretty good books this month! Some have been on my list for a long time, while others were pretty spur of the moment, but nothing disappointed me! This is one of the best books I've read in a while. My co-worker recommended it to me and said that both she and her mom read it in two days. I don't want to give away any spoilers, but this story is not what you think. As soon as you get comfortable with how things are, there is a HUGE change. That part sort of reminded me of Gone, Girl. This book is much softer than that and focuses on the love story a little bit more. I highly recommend this one. I have been trying to slowly read the Harry Potter series again. I loved this series and really grew up with it. This one used to be my favorite book, but now I'm not so sure. I'll have to let you know once I finish them all! Speaking of growing up with a series, I also grew up reading Jodi Picoult. Some of her novels make up my formative memories, and I can pretty much tell what was going on in my life by which book of hers I was reading at the time. So this has been on my list for a while. AND I LOVED IT. The concept is right up my alley. I mean, I love to read about WWII, and there was some mystery thrown in there too. I teared up at a couple of points. Go read this, it's a very quick read for its size. This was recommended to me by the counselor at school when I completed some training. Staff is encouraged to complete "Safe Zone" training, which focuses on LGBTQ issues. This is the incredibly moving story of a family in the US, and their experience with their transgender daughter, Nicole. It is extremely well written and very pertinent to issues going on in the world today. It was very refreshing to see a first-hand experience from a family with a transgender child. Their experiences say a lot about our society, and nothing is sugar coated. Our library gave everyone who finished two books this summer a free paperback, which is awesome. Dave and I have been trying to build our library, so being able to choose a classic like this was a great opportunity. This book was an easy, quick read, but I didn't love it. I have read H.G. Wells before and expected the language to be what it is, but the plot of this is just weird. I've been trying to read more cookbooks and increase the recipes that I have in my recipe box. If you like any type of comfort food, you MUST read this. Chrissy Teigen is hilarious, and I love that she includes little stories and anecdotes through the book. We've made a couple of the recipes, and they are to die for. Warning though, you probably don't want to try these recipes if you are counting calories. I read Alan Brennert's other major novel "Honolulu" last year and loved it. I picked this up at the library and thought the concept was really interesting. You don't hear much about modern leper colonies, but that is just what the island of Moloka'i was. It was nice that the story followed Rachel, and talked about her life, in addition to her life with leprosy. Alan Brennert does a great job creating characters, and I always want to know more about them. *Provided in exchange for review by NetGalley. All opinions are my own. I didn't realize that this was supposed to be a romance novel until I was pretty far into it. That just goes to show you how much I was paying attention when I requested it on Netgalley. The concept is really cool. Two brothers come to a southern town to restore an old mill and convert it into a restaurant. A skeleton is found in the basement, and one of them tries to figure out who it is, and what they mean to the mill. There is a love story woven in between the one brother and the Innkeeper at the B&B they are staying at. While that was interesting, it wasn't really central to the plot. I liked the parts about the 1800s much more. This was our August book choice in my online book club Friends, Wine, and Books. I have read a couple of Liane Moriarty's books, and I have to say this one wasn't my favorite. It starts out kind of slow and doesn't have the same level of intrigue that her other books have. If you look at it on its own it is alright, but comparing it to her other novels shows that it's lacking. Those things aside, I did like the resolution. It is always good and refreshing to see people work through their problems. If you are interested in joining us for September, check out the Friends, Wine, and Books page!